A low profile alternative to our traditional "Tall" fire pit. This product is typically used as a self-feeding grate in an existing masonry fire pit. One piece construction with four legs for extra stability. 21" Tall, 23" Diameter at the top. Constructed from ¾" solid steel bar. Unit weighs about 62 lbs. in the box. I was hesitant on purchasing this product for the price but my fire pit sits on top of a concrete slab and the flames were therefore low and you couldn't feel the heat or see much of the flames. I thought this would raise the fire up and boy did it ever!! It arrived quickly, fits perfectly and was obviously well made and the design is top notch. The fire is now the perfect height and it burns much better with no need to mess with the logs. Most importantly my wife is now warmer on the cooler nights. We love our fire pit and have named it the "Chalice of Fire" It works best if the wood is cut to a length that will stand vertically in the chalice and radiates way more heat than a conventional fire on the ground. We have 3 of them for our different fire pits. Highly recommend it!! best fire pit accessory I've owned. The basket design makes fire maintenance much easier. Arrived quickly. Well made and when it gets up to 25 degrees outside, I will try it. This is my 3rd purchase and have been very satisfied. I have 2 friends who went out and bought the greatest for inside. All good. You won't be disappointed. 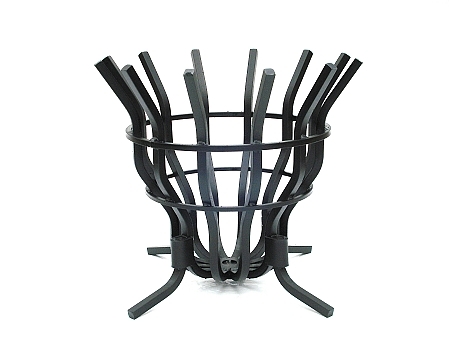 This accessory for my fire pit is very well made! I would recommend this for cooking with a big disk or just sitting around the campfire!I'm very satisfied! LOVE IT! I had been eyeing this outdoor fire grate for a year or two, and finally made the plunge. It is a thing of beauty! Especially when loaded to the top. Loading the fire is as simple as setting logs on top horizontally. The bottom holds the hot coals, while the top burns beautifully. Keeps everyone nice and warm. I had wanted to buy this for a couple years--but resisted because of the price. Then I finally bit the bullet. I'm so glad I did because it's one of the best things I ever bought!